A burden of proof is exactly the rational way to choose between multiple possibilities, exclusive or not. Which everyone has evidence, then that is the one to accept as true. To claim that this is not the way is being deceitful and an attempt to remove a potent weapon from your opponent. Nothing more. Getting evidence is how we choose the one that is more likely than not true. Claims of “good reasons” and choosing by these supposed self-claimed “good” reasons even if something is more likely not true, rather than evidence show that you know you haven’t the evidence to support your claims. Joe, this is probably the most obvious example of a Christian admitting that they would believe, no matter what evidence was presented. As soon as I see a Christian say “proper reasoning”, I know it only means “reasoning that ends up with you agreeing with me”. You want to define rational as “anything that agrees with me”. It’s such an obvious tactic, it’s a shame that Christians use it and think that someone will believe them. So, we start with “theoretical rationality” which seems to be a nonsense phrase invented to try to give your “believe with no evidence” need some scientific sounding rationale. You also try your best to poison the well by accusing atheists of having closed minds if they don’t agree with you. I’m glad you agree that asking for evidence of miracles is a good place to start. I’m also glad you admit that the term “signs” means miracles. I’ve encountered Christians who claim otherwise in their attempt to claim that Christians aren’t promised to be able to do miracles. I’ve also encountered Christians who claim that there have been *no* miracles for thousands of years. It’s no surprise that you have to try to denigrate any other god than your own with your snide “gods of the internet”. Oh well. You ask what sort of evidence to we have of miracles supporting the existence of a god. If personal claims of miracles are evidence of a god, then most if not all religions now have equal evidence to you for their gods, past, present and future. You run into one major problem, the presupposition that Jesus Christ existed and did miracles. We have stories, aka claims, but no evidence for that. You also bring up that if a lightning strikes a ship at sea and for some weird reason it is considered a miracle, why should we think it proof of Thor? Well, why *shouldn’t* we? We do have some criteria to try to figure out if some claim has occurred. These same things can be used for historical and present claims. 1) Multiple sources 2) Preferably Independent sources 3) Non biased sources 4) Contextual credibility 5) Close in time to the events 6) No contradictions/internally consistent. In that I have rationally compared these gods to your god, Joe, I know that your claims don’t stand up to historical criteria. There is no “good” reason to believe in the Christian god or any other god. Now, I suspect you’ll just claim, falsely that I did not do this “rationally” which again goes back to you trying to define “rationally” as agreeing with you. You also try the same nonsense with insisting that only those who agree with you are “serious”. Now, let’s look at the other historical criteria. #2 is “preferably independent sources”. I’m pretty sure that Ehrman says “independent sources”, but we’ll go with what you have said. We have no independent sources for the claims in the bible. What we do have are historians reporting on what Christians believed. We know that the gospels were not independently written, and there are various theories on how that worked from the posited “Q” document to the hypothesis that the gospel writers got their ideas from Paul’s letters. We have no contemporary sources citing miracles, no fishes and bread, no gathering of a legion’s worth of men (plus women and children) twice outside of Jerusalem, no dead being raised, no dead walking the streets of Jerusalem, no magical major earthquake and no sky darkening. We also have no evidence of events JC mentions in the bible, like the flood. So, your claims fail that criteria. Criteria #3 is Non biased sources. Those are a difficulty for many historical events. However, we can compare versions and see what is consistent, from protagonist and antagonist sources. We also have to compare those sources to physical evidence, like any court case. In that we have only reports of what Christians believe, which endangers no one, those sources are pretty neutral but they aren’t critical. We also have the bible, and in it the gospels, which contradicts themselves (you can’t have both JC saying its okay to touch him and then have him say it’s not), so it is not a trustworthy source. We also have that same problem of no physical evidence to compare stories to. So your claims fail this criteria. The fourth criteria is “contextual credibility”. I’m not sure exactly what you might mean by this but I’ll take a stab at it. This would be if the claim fits into the historical context that the claim is being made about. Now, we have these events supposedly happening in Roman occupied Palestine about 2000 years ago. So, is a story about a man gathering a legion’s worth of men outside of an occupied city twice and not being noticed probable in what we know about Roman occupation? Is the claim of a census that would have uprooted the country with everyone running back to where they were born probable when the Romans never did such a thing nor is there evidence of this? Is no reports of a man who can raise the dead and heal people probable in a society that had a life expectancy of around 40 years thanks to disease and injury? In my experience, Christians try to simultaneous claim that JC was very famous, but then try to claim that he wasn’t when it is shown that no one noticed him. “Close in time to events” has been dealt with so we have #6 left, “no contradictions/internally consistent”. This is where your claims fail the worst, Joe. We have the gospels which contradict each other especially in the events around the supposed cruxifiction. We have no moment in gesthemane in John; JC isn’t afraid at all. We have various versions of who was first into the tomb, and what they saw, all contradictory. We have the thieves claimed as both mocking JC and another story where one doesn’t. We have a claim that the apostles were so afraid that they hid in a locked room, and we have the same apostles at the same time going back to Jerusalem to celebrate in the *temple*, home base for the Jewish leaders. Now, what I guess you will do is say that the “details” aren’t important. Well, Joe, in historical criteria, they are important. I think a rational person when deciding any volitional act in light of uncertain circumstances/state of affairs must consider the evidence supporting what the state of affairs are as well as the consequences if the state of affairs varies. As much as I would love to disarm all my opponents I do not tell anyone this in order to disarm them. I tell them this because I really think only considering the evidence supporting what the state of affairs is and not the consequences of their volitional act in light of the different possibilities is irrational. This approach is not really questioned in game theory I am not sure why you think it is so objectionable or is somehow evidence that Christians are cheating. “As soon as I see a Christian say “proper reasoning”, I know it only means “reasoning that ends up with you agreeing with me”. You want to define rational as “anything that agrees with me”. It’s such an obvious tactic, it’s a shame that Christians use it and think that someone will believe them. As you can see I picked up the distinction from a Princeton University webpage most likely written by a professor of philosophy there Named Gideon Rosen. I am not sure he is the author I am basing it on the grosen in the weblink matching the grosen in his Princeton weblink and that he is a philosophy professor at Princeton. I have no reason to think he is a Christian and I would guess the Princeton philosophy department is not brimming with Christians. But he might be I don’t know look for yourself. He didn’t seem to hold himself out as one that is for sure. Please provide the quote because I don’t know what you are talking about. All atheists disagree with me yet I think many and even most are open minded. “I’m glad you agree that asking for evidence of miracles is a good place to start. I’m also glad you admit that the term “signs” means miracles. I’ve encountered Christians who claim otherwise in their attempt to claim that Christians aren’t promised to be able to do miracles. I’ve also encountered Christians who claim that there have been *no* miracles for thousands of years. Are you outraged on their behalf? You think all the miracle claims are all weighted exactly equally? I don’t presuppose that Jesus Christ existed and did miracles I look at the historical evidence. I exaplain why lightening striking a ship might not be evidence of Thor. There may be no reason to link it to Thor. Of course if someone said “By the power of Thor I strike this ship with lightening!” And then out the persons bare hand lightening sprung striking the ship that would be evidence I agree. Again I am not necessarily saying it would be convincing evidence but it would be evidence. “We do have some criteria to try to figure out if some claim has occurred. These same things can be used for historical and present claims. 1) Multiple sources 2) Preferably Independent sources 3) Non biased sources 4) Contextual credibility 5) Close in time to the events 6) No contradictions/internally consistent. Was Tacitus there? Nope. Do we know any eyewitnesses by name? Nope. Is it multiply attested? Not that I know of. Were those persons actually present to attest to the facts, the physicians who told him well if it works claim to be from God and if not blame the people – that would make the most sense. (Assuming that really happened which Tacitus clearly does not intend) I mean I don’t think emperor would have that sort of conversation in public do you? So how would Tacitus know? And if it was Vespasian’s physicians, then of course they would gain by saying it worked! Is Tacitus kidding when he says nothing to be gained by falsely saying it worked? Yes Of course he is kidding! I think Tacitus would laugh at you if you took that seriously. But setting all that aside if it happened this way would we really then think ok clearly Serapis is the God to worship? I mean the whole story is amusing. Compare this one miracle story to the many miracle stories of Jesus that are multiply attested and clearly from the context meant to be taken seriously. And yes unlike saying the king is divine they actually had much to lose by saying he was sent from God. He was literally killed and the apostles risked their life. You keep saying historical accounts are just claims but historians consider what is said as evidence not just claims. And we do the same thing when people tell us something. I agree at worst it is false. But it is based on the records. Based on what Tacitus’s amusing account of Vespasian? That said I do think there are some claims of miracles or supernatural that are at least possible. It is true that whenever I hear of a supernatural account that does not fit my worldview I am perhaps more skeptical but I am not completely closed off to the idea that it is possible that a supernatural event could happen. Whether that would have an effect on my life is a different story. Is it possible someone saw a ghost? Well it doesn’t really fit with my worldview but that does not mean I am going to say I am absolutely certain it never happened. Why don’t I investigate this more? Well what is the point. Lets say I spend my life investigating and at the end of the day I decide that yes there are 3 cases where I think more likely than no this person saw a ghost. I mean it doesn’t really fit the Christian view but it is not entirely inconsistent. I mean if a group of people all just said they saw a ghost it wouldn’t lead me to say aha I now must stop being Christian and be a Buddist or an atheist. As for claimed Christian miracles I am somewhat complacent because although I tend to doubt any given miracle story I tend to think some are true. But its not a big deal that a boy claims to go to heaven because yes I believe in heaven so I am not surprised. Unless you think theoretically rational reasons, practically rational reasons, and logical consistency are good reasons. Of course I think my own view is the most rational. And I expect atheists think theirs is. But I don’t think on the whole atheists are less rational than theists. Ehrman mentions preferably independent because multiple sources not only indicates multiply attesting from different people but having multiple source documents helps determine that the story didn’t change. It seems pretty clear that the 4 authors of the gospels were different people and not Paul who is another source. It is true that many scholars believe Mathew and Luke had access to Mark. And it may also be the case that they had access to another source Q. But Q and Mark John and Paul are all certainly independent. And Mathew and Luke seem to draw on some of their own sources as well. In other words we have lots of sources for the miracles of Jesus. Now what you are saying you want non-christian reports of his miracles right? Well think about that. If you saw Jesus die and rise from the dead like he said he would would you be a non-Christian? Moreover my grandfather was born in Ireland about 1904 or 1905 and he lived there until he was in his early 20s and I can’t find a single record naming him by name anywhere in Ireland! Now you want to ask for records of something that happened 2000 years ago about a person born the son of a Carpenter! We have an amazing amount of records of Jesus. And yes we do have some historical records outside of the bible. Physical evidence is rarely available to prove very much in history. I would say precious little history is proven by physical evidence as opposed to written accounts. Prehistory is usually defined as that time before written records were kept. That should tell you how important written accounts are to history. Are Do you think the emperors physicians or subjects would not be biased to portray him as glorious? Bias can be looked at a few ways. People professing to Jesus’s resurrection had no good incentive to say make that claim. In fact it could and did get many killed. No one wants to die for a lie. Contextual credibility would be triggered if we found an account that said said Jesus stopped to get gas in Galilee. We know there were no cars at the time. But it might also mean some of the things you are talking about as well, but I don’t think you are making a very good case. Again we have very little in terms of records from the time. And it sounds like most of your claims of contextual issues assume we have plenty that document everything that happened from census’s to every movement of troops. No. That’s not right. It is not like historians will typically throw out a whole account just because a few details are wrong. That is not how it works. If you have a historian telling you different let me know. I can certainly tell you a judge or jury will not throw out a witnesses entire testimony just because a few details are off. Have you ever given a report of an event and then looked at it a year or more later? If you did then you would know that although people get minor details mixed up all the time that does not mean the overall account is wrong. You also are back to trying to claim that rational people agree with you, when that an unsupported opinion trying to validate your beliefs. You may “really think” this but it has nothing to support it. You have no evidence that your god exists or that you have the right version of it. And trying to sound impressive by citing game theory doesn’t work with me. When I say burden of proof, it is when a positive claim is made and it is up to the claimant to support their claim. Nothing more, nothing less. It’s no surprise that you try to claim that there is no such thing, since, again, you have no evidence to support your claims that your god exists and you have the right version of it. You can refuse to support your claims and refuse the burden and pretend that the burden doesn’t exist, but that only shows that you have nothing but baseless nonsense. It’s also pretty typical that you would try very hard to change the definition of a logical fallacy to suit yourself. Your tactics would be laughed out of a court of law, no matter how good a layer you may be otherwise. It’s also curious to see that you are okay with your baseless claims but aren’t okay with others because “it sounds made up”. That’s what your claims sounds like, Joe. You really believe it, but again it sounds made up, just like any other religious myth. And yes, whomever claimed that purple and yellow spotted platypuses would have the burden of proof to show that they existed if they made the claim that they existed. What a poor attempt to try to excuse yourself from presenting evidence for your claims. You should read Carl Sagan’s essay on the dragon in his garage: http://godlessgeeks.com/LINKS/Dragon.htm I also find it pretty amusing that you seem to think some people actually believe in the FSM. If you claim a god exists, then it is not a “philosophical burden of proof” it is just a burden of proof. There are no differences between them. You’ve again made something up to excuse your failure. You also again falsely try to claim that anyone who disagrees with you are “stubborn” and “irrational”, such failed attempts at poisoning the well. I believe you are missing a link. We have you making another false claim that you aren’t trying to convert people. You are, with your false claims that one must be irrational and stubborn to not accept your opinions. I currently am chatting with a Muslim who made the same claims as you, that a “proper education” will end up with everyone agreeing with *him*. You also try an appeal to authority with your claims of professors from Princeton and somehow his opinion is to be taken as some truth. And nice try, but I never said anything about an “evil Christian”. Please don’t try to lie about what I’ve said. You also try to claim that Rosen might not be a Christian, no evidence, and that philosophers aren’t usually Christian, another baseless claim. With that name, he could be of Jewish decent and a practicing Jew of some sect for all I know. The link on the wiki page about him goes to a good video interview with him on the NYT site: https://opinionator.blogs.nytimes.com/2011/12/12/an-interview-with-gideon-rosen/ I have a subscription, and I can loan you my log in if you can’t see it and want to. Here’s the quote you asked for “Well lots of things could be evidence for God for different people. If the atheist refuses to believe anything could be evidence for God then ok you are probably dealing with a mind so closed no amount of rational discussion will help.” And I know, we’ll end up playing the game that Christians often like, “I didn’t say it exactly so you’re wrong.” Oh well. Nope, not outraged on anyone’s behalf. Just pointing out that you are a snide twit when it comes to the gods of other religions, when you have no evidence for yours, just like them. Hypocrisy is what I expect from most Christians. And yes, I do think that all miracle claims have the same weight: baseless claims that have no evidence to support them. If you have evidence that the other religions don’t, please present it. Joe, there is no historical evidence that Jesus Christ existed or did miracles; so you do presuppose (to require as an antecedent in logic or fact) this character’s existence. We have claims he did and reports that this is what Christians believed, nothing more. We have no contemporary reports of Jesus Christ son of god or of miracles. These supposed miracles would have had physical results and again, there are none. What you claim as “historical evidence” is no more than what we have for other religions, religions that you claim are not true. We have reports of what believers in Isis, Zeus, etc believed in. We have reports of miracles by these gods as I presented. We have temples and texts about the worship of these gods. You have nothing different. If you claim those things as evidence, then Zeus, Isis, etc are to be considered as real as your god and as true as your religion. You want your religion to be considered different and there is no reason why it should be. We have Christians make claims that their prayer caused a miracle. They cannot show any causation, they look at a correlation and presuppose their action had a certain result. That is the same as the posited Thor worshipper. A correlation is not evidence. What you claim evidence is again only a claim. You need evidence to support a claim and a claim can’t be its own evidence. It’s like saying “the qu’ran said this so it has to be true because the qu’ran said this”. You wouldn’t take that as evidence and neither would I. If you are a trial lawyer, you must have quite an ability to compartmentalize things. You claim this as a definition of relevant evidence “Relevant evidence” means evidence having any tendency to make the existence of any fact that is of consequence to the determination of the action more probable or less probable than it would be without the evidence.” In that we have no evidence at all for magic, there is an extremely low probability that magic exists. Humans have been making claims about it and trying to show evidence for thousands of years. They’ve failed. Now, in a court of law, we start with claims, as I’m sure you are aware of. The prosecution has a claim that the accused did something and how it was done. The defense has a claim that the accused did not and why not. Their statements would not be taken as evidence. They would be required to present evidence to support those claims. In your analogy on your link, the stories in the new testament are claims that Jesus did this and such. They are not evidence. A claim doesn’t make it more likely that the claim happened. I could claim that there are fairies, which doesn’t support that fairies exist. What you would expect of me is evidence to support that claim. A claim of a miracle isn’t evidence that another miracle happened; there is no evidence of either. It’s hilarious to see you try to claim that Tacitus wasn’t being serious. So, Joe, how do you know what he was thinking when it wrote that and when he wrote “Consequently, to get rid of the report, Nero fastened the guilt and inflicted the most exquisite tortures on a class hated for their abominations, called Christians by the populace. Christus, from whom the name had its origin, suffered the extreme penalty during the reign of Tiberius at the hands of one of our procurators, Pontius Pilatus, and a most mischievous superstition, thus checked for the moment, again broke out not only in Judæa, the first source of the evil, but even in Rome, where all things hideous and shameful from every part of the world find their centre and become popular. Accordingly, an arrest was first made of all who pleaded guilty; then, upon their information, an immense multitude was convicted, not so much of the crime of firing the city, as of hatred against mankind.” All you are doing is the usual Christian tactic of trying to use your magic decoder ring to declare some parts perfectly fine (often to be taken literally) and other parts too ridiculous to accept. Reading both shows no different between the claims and their supposed “seriousness” to Tacitus. Again, you try to lie and say that the miracle stories of JC are multiple attested. That is not true, we have repeated claims in the bible, and nothing else except reports that Christians believe in some strange things. There was nothing to lose for believers to be sayin that Christians believed in some things, and nothing for the authors of the bible’s books to lose by saying the same things are true. You also try the “but they wouldn’t believe if it would get them killed.” People believe in many thing that cause them harm. Muslims do, Hindus do, Christians of different sects did when you all were murdering each other over which version of Christianity was right, and people who believe in cults do all of the time, see: People’s Temple, Heaven’s Gate where humans cut of their own genitalia because they believed in something supernatural. Should we consider Jim Jones a messiah and that there really was a spaceship behind Comet Hale-Bopp? No, historians don’t consider claims as evidence. That is another baseless claim from you. And I certainly don’t accept a claim as evidence when people tell me something. If someone tells me that they have a dragon in their garage, that is a claim, not evidence. That is also another false claim from you, made for the expressed purpose to give yourself an excuse. You claim that there are “records” about JC’s miracles. That is untrue. It’s great that you keep trying to claim that Tacitus was trying to amuse you with the account of Vespasian. You have no evidence of that, only a need to claim one story is meant to be funny and another is not. A couple of paragraphs after Tacitus’ words about what Christians claimed, we have this “At the close of the year people talked much about prodigies, presaging impending evils. Never were lightning flashes more frequent, and a comet too appeared, for which Nero always made propitiation with noble blood. Human and other births with two heads were exposed to public view, or were discovered in those sacrifices in which it is usual to immolate victims in a pregnant condition. And in the district of Placentia, close to the road, a calf was born with its head attached to its leg. Then followed an explanation of the diviners, that another head was preparing for the world, which however would be neither mighty nor hidden, as its growth had been checked in the womb, and it had been born by the wayside.” Hmm, Joe, was Tacitus trying to be funny here too? Or here in the same chaper as the claims of Vespasian’s miracles “And so Vespasian, supposing that all things were possible to his good fortune, and that nothing was any longer past belief, with a joyful countenance, amid the intense expectation of the multitude of bystanders, accomplished what was required. The hand was instantly restored to its use, and the light of day again shone upon the blind. Persons actually present attest both facts, even now when nothing is to be gained by falsehood.” http://www.sacred-texts.com/cla/tac/h04080.htm How “funny” is that, making the same claims as you have? Joe, I know that you don’t believe in miracles from other religions. To try to play coy and say you are “perhaps more skeptical” is ridiculous. You deny it would affect your life, which is pretty silly since you religion claims that miracles are evidence of gods. Seeing ghosts is entirely outside of what the bible claims, but heck, if you want to claim that it does, oh well. You would simply ignore what you’ve found out, nothing surprising there. And I know you are quite complacent when assuming the claims of your religion to be true. That’s no surprise at all. All theists are. You accept whatever claim is convenient to you and discount the rest because you need to. To claim that “hey a boy goes to heaven, and sure I believe that without question because it agrees with what I want to believe” indicates you have no interest in rational thought at all. Again, all theists claim that they have “theoretically rational reasons” and they are just like you, Joe, willing to believe anything as long as it fits with what they *want* to believe. Anything that doesn’t is ignored. There is no logic to that idea “I will believe because I want to believe no matter what”. If your claim is right, then every single theist has the same “good reasons” to believe as you and their religions are true, making the claims of the bible, with its claim of having the only one god, wrong. You’ve repeatedly claimed that you know that atheists are less rational than you. Oh well, it’s no surprise that you’d claim otherwise, it’s embarrassing to admit that you really do think that to be rational one must agree with you. That a story doesn’t change in multiple sources only indicates that people are good copyists. By your claim, the qu’ran must be really believable and true. Same with the claims of scientology. What we do know about the gospels, is that most bible scholars, including Christians, are pretty sure that they all come from one source, so even though the authors might be different, the story they copied was the same. Then the authors altered it for various reasons, adding contradictions since they were working alone, and not in concert. The early Christians were not one monolithic belief system. The gospels are not independent by any means. Then when the bible was being assembled, each faction needed their pet version inserted, which has caused Christians all sorts of problems since, creating a industry of apologetics, which also don’t agree. By your own admission “is true that many scholars believe Mathew and Luke had access to Mark. And it may also be the case that they had access to another source Q.” the gospels aren’t separate sources. In that there is no evidence that anyone saw JC die and rise from the dead like he said he would, I wouldn’t be a Christian. However, if like you I wanted to believe that this is true and didn’t care about any evidence to the contrary, I may be a Christian. In fact, I was, wanting to believe such stories. But I, unlike you, decided to follow the evidence, not my desires. We also have the problem that Christians often claim that their god doesn’t give direct evidence and wants Christians to just believe on faith. Per their version of Christianity, no one had to believe in Christ’s resurrection and some chose not to. Which Christian should I believe, Joe? So, yep, where are the non-christian reports of JC’s death and resurrection? You try with a bad analogy to excuse your savior’s non-existence by trying to compare the bible story to a human being’s story. We know that humans exist, live in countries and immigrate. We know thousands of common people came into this country, many getting entirely new names thanks to immigration officials having no clue on how to really spell them (my Austrian maiden name got royally screwed up long before Ellis Island). Nothing magical here at all. Now compare this to Jesus Christ, who supposedly caused all of these dramatic events to happen that people should have known about. You, like so many Christians, try to claim how well known JC was when convenient and then try to claim no one knew about him. 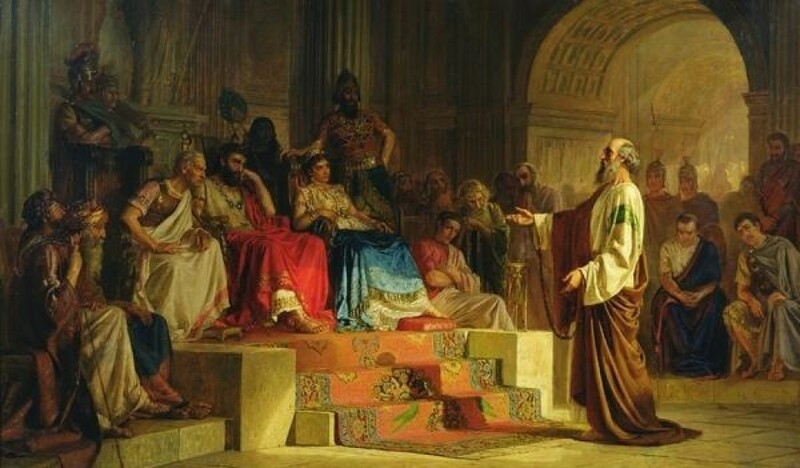 The trial of this man was supposedly thronged by crowds when Pilate asked who should be freed. We have the legion’s worth of men twice outside a roman occupied town. We have no records of JC other than the bible and reports of what Christians believed 60 to a hundred and more years later. You claim that there are historical records about this. Produce them because there is no reason to trust you at all. Physical evidence often is available to support claims about history. You claim otherwise since you need to since you have no physical evidence. I watched a show on King Arthur’s Britain, part of the Secrets of the Dead Series. They compared written claims with reality in archaeology digs, other written sources, and found that the whole Arthur thing was nonsense. We also have physical evidence for Rome having generals and battles in Gaul, etc. Prehistory is usually defined as before written records. 1 century CE is not prehistory. As I’ve indicated, written records are claims without supporting evidence. So, what you “would say” is simply wrong. “Do you think the emperors physicians or subjects would not be biased to portray him as glorious?” Hmmm, do you think believers in some god and some messiah would do the same thing? People who made claims about the dead rising had plenty of incentive to make that claim. They wanted to believe it and they wanted others to believe it. Humans love external validation. You repeat yourself in the false claim that the threat death or harm would stop people from spreading a lie; this assumes that they knew it was a lie. People believe in very silly things and they do die for it: see People’s Temple, Heaven’s Gate, protestants vs catholics. It doesn’t surprise me that you admit that there are inconsistencies, but many Christians insist that there are not. You also have the problem that your bible claims it is inspired/written by god and by having direct contradictions, it shows that humans wrote it all the way. The authors were working from the same sources, and then added their own details which contradict each other. As an example, if you are a trial lawyer, and your client said that they were in a bar drinking on the night of a murder, and someone else said that they were at the murder scene and someone else said that the same person was at the amusement park, you’d note the contradictions. If you had no evidence to support any of the claims, you’d have no reason to think any of them were true. This is where evidence comes in. I do enjoy when Christians claim that differences in their supposedly god written/inspired book aren’t important. The supposed event with the thieves is an important claim when it comes to salvation, but Joe, you just want to ignore the problem because it doesn’t fit in with what you want. I know, that in a trial, the differences are quite a lot more important than you try to falsely claim. You want to claim that the parts you like are inerrant and to ignore the parts you don’t. And when you claim that that accounts “got a thing or 2 just wrong”, then there is no reason to think that they didn’t get more wrong. And we *can* say if this or that is clearly wrong. That’s what evidence is for, and hopefully, as a trial lawyer, you know that. What we are talking about isn’t just a historical account. It is a claim of magic, and it is a claim that this bible is written/inspired by a perfect powerful entity. If details are wrong, the question is why? Why would your god intentionally allow false information to be spread? Is the bible lying when it makes the claim of its source? Historians will know that an account is not to be trusted if it is wrong and will consider the claims to be false until supported by evidence. A judge and jury will consider a testimony suspect if details are off. You wish to try to minimize how things are, Joe and it doesn’t work since I know better. In the case of your claim that a report of an event and then looking at it a year later, humans do indeed get things wrong. The supposed source of your bible isn’t a human, Joe. It can’t get anything wrong. If it allows wrong information, then it either intends it or it isn’t the being you claim. And in the bible, these details aren’t minor. What are the religious implications of no weeping in Gesthemane? With JC never saying to the thief, this day you’ll be with me in paradise? When JC is so holy no one can touch him or that they can? With the relationship between the apostles and the early Christians and the Jews, was it antagonistic or could the apostles go celebrate their messiah’s raising in the temple?